Home / Opinion / YOU HAVE NOW GRADUATED, WHAT’S NEXT? YOU HAVE NOW GRADUATED, WHAT’S NEXT? Graduation is often a time of celebration. Graduates of all ages are recognized for their academic accomplishments at the end of each academic era in their lives. Before this great epoch, at a point in one’s life, one takes a path he or she was either admonished to take or ordered to. At one point, certain things do not come to the fore for one to actually understand what pedestal he or she may be standing on and to what height they are aiming. At another point, some get to begin to learn either from what they are taught or from what they read on their own and from certain life experiences. From these, they on the one hand know the true nature of their trips, and on the other hand begin to make choices as to which destination to drive their destiny. During this human voyage to greatness, some may go through snaking routes while others might as well jump on bumpy paths. While this futuristic adventure continues, some fall off the path and then tagged as drop outs. Others become unequivocally resolute and those who have been loath to continue now follow suit. This determination now gives them the main reason for academic pursuit: to create a success story anywhere in the world and to brace themselves. Some do not go where the path may lead; they go instead where there is no path and leave a trail basing it on Ralph Waldo Emerson’s quote. Some years back while in my second year in the university, I once asked the then graduates this question remembering that one day, my own turn shall come. Now it’s dawned on me to answer the questions that seemed unanswered. Despite the fact that you are now graduates, do you expect to be extolled whether or not you were studious for several years? Do you think your deeds would be lauded even if they were good? Who cares whether you are a graduate? After all there are millions of graduates already there before you. It might seem interesting to hear that no one wants to know how well your means were… they are only concerned about the end of the means: your degree and what you are able to offer. Now that you have graduated, what’s next on queue? Under normal circumstances, after graduation, one heads for something higher; one might source for a job immediately; go for service (NYSC); obtain Masters Degree (MSc) and then go further to grab a doctorate degree (PhD). You may want to get second and or third degrees before trying hands on jobs. Some might want to school and work at the same time. As a graduate, which one would you go for first? I would rather you started thinking of what to embark on after a bid to the pursuit for academic excellence. I know in the cause of trying to blast and obtain good grades, so many of you must have taken time to get yourselves prepared and got what you actually aspired for. Some have made it graduating as the best student of their various departments or the entire school through graft (hard work) or theft, whichever way it must have been, the question is, what have you to offer to the whole polity where you are, your field of study or profession, the labour market where you’ll be needed and the country at large? Some time ago, while in year one, I spoke with one of the final year students, I asked him “what next?”, whether he would work in any of the media houses as a graduate of mass communication, he said, “for what? I’m here just for the degree and then I go back to my business”. 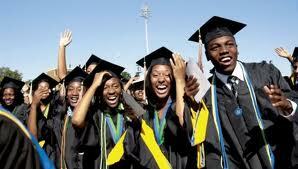 You will now notice that most people have understood the relevance of being a graduate and do not want to be left out. This chap graduated as the best in 2006/2007 session, he is good in the field but that is not his ambition, now he has gone into Nigeria police Force. “The future is not the result of choices among alternative paths offered in the present ― it is a place that is created ― created first in the ‘MIND’ and ‘WILL’, created next in the activities”. Arnold Palmer once said that "The most rewarding things in life are often the ones that look like they cannot be done." You might have studied what you were forced to and seems not have been in your mind and will, but did you make anything out of the activities? Sure you must have, because from the look of things these days, most people go into different fields for the prominence and respects and maybe the money attached to such profession even though they don’t even know they are doing there. You become glad when you hear people call you: “barrister this, doctor that, engineer this” and all of that. Such people end up becoming quacks. I am pretty sure that you are not among such people. I once asked a law student when I did some law courses with them how she wanted to use her legal practice, she said “ha! It is to make money now!”… "The best of all things is to learn. Money can be lost or stolen, health and strength may fail, but what you have committed to your mind is yours forever." Louis L'Amour asserted. Whatever be the case, you have to make sure that something tangible comes out of your being a graduate whether or not you did what you had in mind and will. William Butler Yeats says "Education is not filling a pail, but lighting a fire." Being a graduate, you have to ignite the fire in you and become relevant in the society. As a graduate, your parents must have tried their best possible to see that you attain the height of a graduate; you had better remember that they expect more from you especially if you are the type that sprang up from destitution or that you have younger ones in whose sakes your parents had to borrow certain amount of monies to train you first so that now that you are a graduate, you can now take over from where they stopped probably even to pay back the borrowed monies. As a graduate, have you realized your potentials? Have you flaunted what you’ve got for firm precision? I have come to also understand that knowledge is not power when it is not applied. Then how are you going to apply it? In some firms today, when you go out there to apply for a position, they require you to have obtained one or two professional certificates or belonged to professional bodies like: PMI (Project Management Institute), Quality Management Development Institute, CFA(Chartered Financial Analyst), ICAN (Institute of Chartered Accountants of Nigeria), CIM Chartered Institute of Marketing of Nigeria, NIM (Nigeria Institute of Management), NIPR (Nigeria Institute of Public Relations), NSE (Nigerian Society of Engineers) etc.Iit is against this background that your Bsc, B.Eng, B.A, or B.Ed become quintessential and relevant to the position you pursue. Don’t easily forget that as a graduate, your pocket money is either reduced or suspended, so would you sit at home still demanding for money from mum and dad? Some time ago while I was still schooling, I saw my lodge mate who just graduated still reading seriously as if he was going to write an exam, I asked him why he was still reading when he had graduated, he said that after graduation, life begins proper… interesting! If a graduate can do this, how much more can an undergraduate do? Even a professor still reads. Then if you go further to ask the feminine graduates ‘what next’, about 70% of them would say, ‘marriage’! Have you endeavoured to spread your tentacles in the search for connections so that now that you have graduated, you would change the notion that the moment Nigerian students graduate, they sit at home unemployed? Are you still dreaming dreams that will never come to pass? You had better wake up. You better begin to make your engines rev so that the moment opportunities come, you grab them at once because opportunities no longer come but once. The best thing for you who are still an undergraduate to do is to start now. Begin to hook your tentacles from now so that there would not be any difficulty when you pass out in case you are the type that wants to work immediately after school. Life is full of port holes. Begin to reconstruct your road before you make a gallant walk.